It’s very easy for one or more teeth to go missing as time goes by, whether due to dental decay or an unexpected accident, leaving a smile looking and feeling far from its best. However, instead of focusing on the problem, MayFair Dental Associates is ready to offer you a proven solution. With beautiful, custom-made restorations, we can reliably replace any number of teeth for a lifetime, bringing back your bite and confidence all at once. To learn more about how we can rebuild your smile, contact us today. Why Choose MayFair Dental Associates for Teeth Replacements? A dental bridge is a simple way to replace one or more missing teeth in a row. 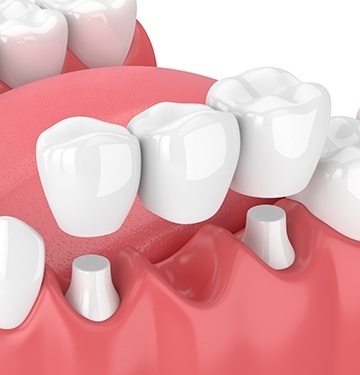 Two dental crowns are placed on the teeth on either side of the gap in the smile, and these are used to support a prosthetic that literally “bridges” the space. With one, we can restore balance to the bite, prevent the remaining teeth from drifting out of place, and give a patient their original smile back at the same time. 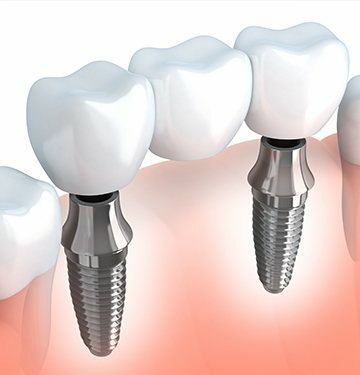 Whether you’re replacing one tooth or an entire mouthful, dental implants are the best way to do it for most patients. They provide the next best thing to a natural tooth, as they are the only treatment that restores both the root and crown. The end result is strong, lifelike, and can be trusted to last for decades longer than other traditional options. And, at MayFair Dental Associates, you can get the entire procedure completed in just one location for maximum convenience. For generations, dentures have provided an effective and affordable solution for patients missing a large amount of teeth. Here, we can specially-design a prosthetic to meet a patient’s unique needs, whether they are missing a few teeth along a single arch or an entire row. 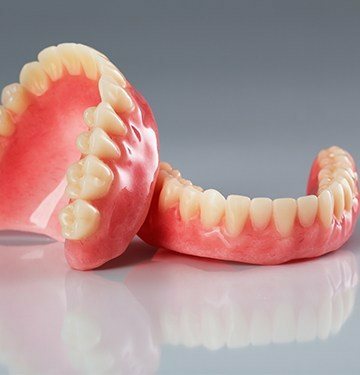 Whatever the case may be, we always ensure that our denture patient’s walk out of our dental office with a smile that is both functional and aesthetically pleasing. Our patients also have the choice between a traditional removable denture or an implant-retained one that doesn’t need to be taken out!